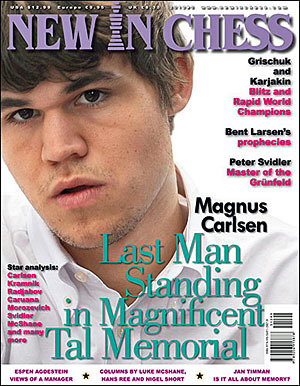 Carlsen’s victory at the 2012 Tal Memorial is the latest in the seemingly endless headline stories about the Norwegian phenom. These accounts are almost as endless as the dramatic ways Carlsen is winning. This was a welcome respite from the World Championship which had an endless string of technical draws after which Gata Kamsky excoriated play in the match calling it an exercise in preparation (see Timman’s article). Of course this can be debated and certainly the match had its moments, but the Tal Memorial was end-to-end and exciting display of chess. While Carlsen is a regular subject, Luke McShane, dubbed “the world’s strongest amateur,” played with a sense of urgency and scored three victories against elite competition. He toppled Vladimir Kramnik, Alexander Morozevich and Levon Aronian and stated that he had never before beaten such players in the same tournament. The story had Carlsen’s nice win over McShane and McShane’s impressive win over Levon Aronian. There was a very interesting article about the branding of Carlsen with insight from Espen Agdestein. He discusses some of the anatomy of building a brand. It’s important to know that the media should be your firends, they are extremely important tools. It’s not enough to be just the best chess player. It’s the media that actually make a brand superstar. If you want to make a brand out of yourself as a chess player, it is not enough just to play chess. You need to talk to the media, have interesting stories to tell. The story gives a fascinating account of how the brand called “Magnus Carlsen” was built from his beginnings as a 12-year old phenom and his first sponsorship from Microsoft. Agdestein would secure additional sponsors for 140,000 euros and continue to build the brand as Carlsen rose into the elite ranks. Of course there were challenges since chess suffers from the lack of worldwide support. However, Agdestein ends by mentioning how he wants to move the Carlsen brand into the social networking sphere in Twitter (where Carlsen frequently tweets), Facebook (has several active pages) and even look at the smartphone applications. Interesting read. Other interesting stories are the World Rapid and Blitz Championships in Astana, Kazakhstan won by Alexander “Sasha” Grischuk and Sergey “Seryozha” Karjakin, respectively. Of course this tournament had its controversy in that the it was not officially sponsored until a month before the match meaning that several top players were not available at such short notice. There was also the qualification debacle mentioned. Ruslan Ponomariov was a casualty in that he qualified for a berth before the blitz had to be reorganized. The new organizers chose a totally different field and negated the qualifiers from Aeroflot. Never a dull moment in the chess world. Having once admonished me for giving Sergei Tiviakov the crown for the most-traveled chess player, Nigel Short’s lead is intact as he celebrated his 100th country visited in Peru. It was not a tournament, but rapid match against Julio Granda-Zuniga. It was also an official visit where he gave his customary simultaneous exhibitions and met with a number of the country’s brass in chess and political circles. He reported that the young crop of Peruvian juniors are indeed very strong. Hopefully, Short will one day write a tome about his globe-trotting experience. There is an interesting story about one of the most intriguing personalities chess has ever seen… Bent Larsen. Although Larsen has gained infamy for being crushed by Bobby Fischer 6-0 this feature was about a game played at the famous 1966 Piatagorsky Cup in Santa Monica, California. The article annotates his game with Fischer in this tournament with a sideline on the Karpov-Korchnoi match in Baguio, Philippines where the Open variation of the Ruy Lopez became theoretical fodder. There was a long analysis of this game and if nothing else, proved that Larsen could actually beat Fischer after all. It has nothing really to do with chess… It used to be just a game of intelligent people, they play against each other and it was just pure chess: Who is strong on the board? But right now chess, as you can see from the matches for the world championship, it becomes more and more of a team effort. Basically your whole team is studying for a year. The seclusion, all they do is chess, chess, chess, analyse lines, prepare. And then the cadidates, both of them – opponents – all they have to do is simply memorize those preparations, get to the board and just show that preparation. There is no chess skill involved in that! It’s just all memory and that’s it. Fischer predicted that chess would have to evolve into 960 or “Fischer Random”. We have not seen such a movement, but certainly the debate on draws rages on. Deviate at move 6 in the Tarrasch!